Planning every little detail of the wedding, the flowers, cards, sweets and what not, make sure you have your outfit covered too. It is only way important, probably featuring right next to the event itself. And no, it is not a last-minute job. There is a reason that shopping takes time, now isn’t there. 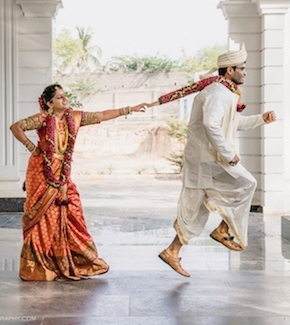 Although any kind of lehengas work, it is not about working but looking your best on the wedding day. While buying your lehenga there are a number of things you have to keep in mind: your body type, the shape that suits your body type, the embroidery. And of course, the colour for your wedding lehenga itself. Colour is one of the essential factors right alongside fitting. If it does not compliment your skin colour then it can really go wrong. 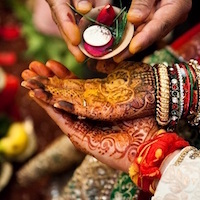 Before choosing the colour for wedding lehenga, make sure you know your skin tone. Is it cool and on the fairer side or is it warm, dusky, olive toned or more chocolate in tone? Once you have that figured out choosing a colour should not be difficult. Also, one has been shopping for a long time and usually knows what colour compliments them the best. So keep that in mind when shopping this time around as well. Choose the best colour for wedding lehenga for your skin tone! For the ones who have a cool or a paler skin tone, you could always go for brighter shades of pink. Shades like raspberry or sorbet, a lime green or brighter shades of blue. If monotone is not really your style then you could always mix these shades too. 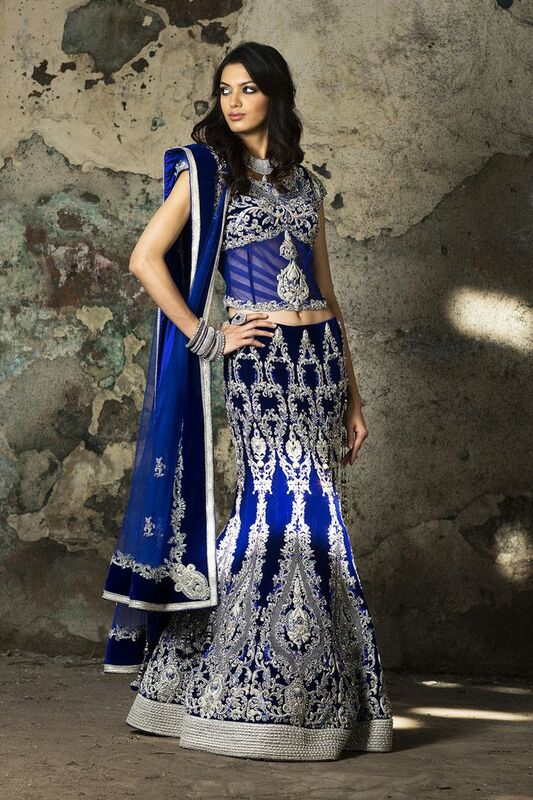 A royal blue lehenga with a pink blouse and a touch of pink in the embroidery. Or a lime green with a contrasting blouse, a deep shade of blue usually has a way of bringing out the green yet not making it too harsh on the eyes. Both these combinations will make you stand out. While choosing the colour for wedding lehenga also keep the embroidery in mind. And you want to go for the lime green, then go for gold or a duller shade, a bright shade will just make one’s eye hurt. If you like darker shades then you could also opt for wine or an emerald green or a midnight blue. Maybe that a light shade is more suited to your style, then go for peach, mint green or light pink. While choosing these, however, make sure they do not have the effect of being lost in the background. A light shade on a light skin is a tricky combination but with the right embroidery and jewellery. It could really make your look. Colours to definitely stay away from are bright shades of red, pastel hues and beige and neon hues. If your skin tone is warm and dusky turn to shades of fire. Shades of yellow, orange, red or even a hot pink would be your go to colour for lehenga on your wedding. You could try coral shades, orange, a saffron yellow, rust or peach. The aim is to look bright. The more the colour contrasts with your skin the more vibrant you look. You could even try duller or dustier shades of pink, they are not that bright and with a dull gold for embroidery. It would make a perfect blend. Also, try for smaller embroidery instead of big ones, the colour of the lehnga is complimented well. Try to avoid neutral colours like a beige or gold. They will not contrast well and may create a washed-out look. Even extremely dark colours like a deep purple or a midnight blue will not be a gorgeous option. So, the aim is to go bright and vibrant. While toned down colours go well with smaller embroidery, you could also go for a slightly more gorgeous look. It can happen with a bright shade of orange-red decorated with larger prints. Ladies who have an olive skin tone, choose the warm pastel shades. 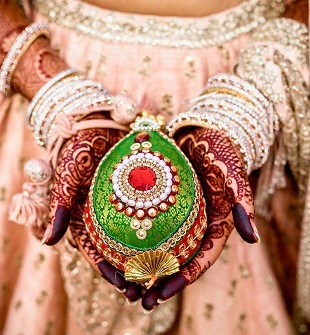 The warm gold, emerald green or dusty pinks as the colour of your lehenga. Emerald green is really an easy colour to pair. You could choose a muted red, pink or a rich shade of purple for the blouse. It even goes well with a dull shade of gold. And if you are fond of silver than gold then you can definitely go for the silver embroidery mixed with a tinge of colour. While choosing pastel, however, avoid the icy cool ones, warm pastel is what you should be looking at. Another brilliant choice would a burnt orange. It really compliments your tone. Keep it as simple as possible with the embroidery so that the colour is the focus of the lehenga at your wedding. Colours to avoid are wine, neon colours, cool toned reds like maroon, tomato red, copper and brighter shades of gold. If you really like red, you could try orange reds or muted reds.